We now offer the Medium Duplex Dog House with a single door for medium and smaller dog breeds. It’s a smaller version of our Single Door Large Dog House, with all of the same great options available. This house has a single center door, and is perfect for a couple (or more) smaller dogs that “get along”. House pictured includes optional windows and shutters. Blythe Wood Works is now offering the Medium Duplex Dog House with a single door. This house is a smaller version of our Large Single Door Dog House, and has all the same great options available. The compartment is 60″ wide and 30″ deep and with a single center door, it has a gracious wind free sleeping area on each side. The perfect house for a couple (or more) smaller dogs that “get along”. 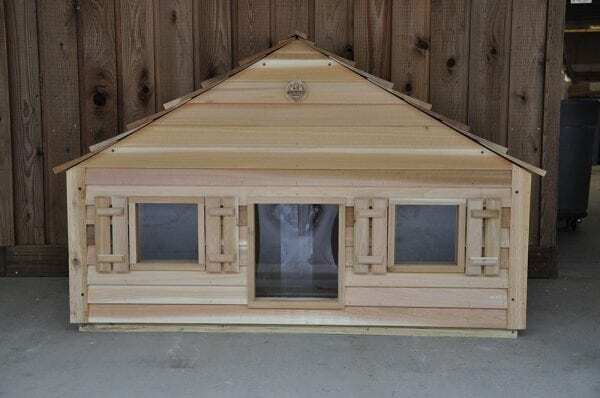 Finally, the Single Door Medium Duplex Dog houses have a roof line that causes the rain to fall to the side of the house, not at the door where your dog will track in mud and water!